Some 200 Wood River Middle School students learned about science, math, the environment, wilderness survival and global awareness at an environmental camp held the last week of September at Cathedral Pines north of Ketchum. 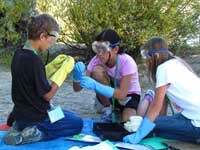 Two groups of students attended the camp, officially called the Residential Outdoor Environmental School, for two days each. "For many students, ROES is the first time they had the opportunity to attend an overnight camp," said Heather Crocker, Blaine County School District director of communications. "ROES teaches valuable science, language arts, math and social studies content. The lessons learned here continue in the classroom throughout the year." At the camp, students learned about such things as how to create small solar reflectors, how the world's increasing population affects the environment, how to recognize and use edible plants, wildlife spotting and how to test for dissolved oxygen in water. "Outdoor environmental education is often one of the most memorable learning experiences our students have," said the environmental school's director, Leila Jean Greer, who also teaches language arts at the middle school.